Gibbs Roofing was founded in 1950 by Milton Gibbs. The Gibbs owned and operated Gibbs Roofing, until 1990 when ownership was transferred to his son Daniel Gibbs. Under the leadership of the Daniel Gibbs Sr., Gibbs Roofing added a remodeling department and became Gibbs Roofing and Remodeling. As a leader in the roofing and remodeling industry, Gibbs Roofing and Remodeling, has established a reputation of quality and reliability. Their workmanship and up-to-date product knowledge has recently earned them the GAF and Velux Certified installers to provide its clients the peace of mind that all of their roofing and remodeling needs will be handled by one company . The majority of their work comes from satisfied clients which is a testament to their performance and ongoing commitment to quality craftsmanship. Gibbs Roofing & Remodeling serves both Massachusetts and Rhode Island. My grandfather Milton Gibbs, and his brother Frank Gibbs, started the company in 1950 in Marion, Massachusetts. I am the third generation owner and operator of a well established company, known for building, remodeling, and roofing. As a youg adult, I attended the Old Colony Vocational School in Rochester to take carpentry for four years. I received my construction supervisor license at 22 years of age and now operate Gibbs Roofing and Remodeling. We build new homes and all phases of remodeling and fine finish work along with professional roof installation. The mission of Gibbs Roofing and Remodeling is to provide quality while conforming to 100% of our clients needs. We are committed to continues education to ensure we provide the best possible products on the market that are reliable, and are environmentally friendly. "Quality is doing it right when no one is looking." 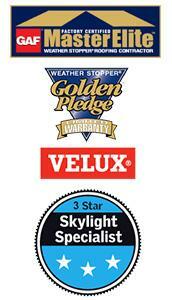 Gibbs Roofing and Remodeling is GAF, and Velux Certified providing up to 50 years of Non-Prorated Protection! GAF is quality you can trust from North America's Lastest Roofing Manufacturer! It means we build to a higher standard using materials from the largest manufacturer of roofing supplies in North America. It means we install a system rather than a mix of products that happen to be on sale that week at the local hardware store. It means we offer more long term benefits by way of the manufacturers warranty that you cannot get if your roofer is not certified. It means you get more . . . more performance, more professionalism, more value.